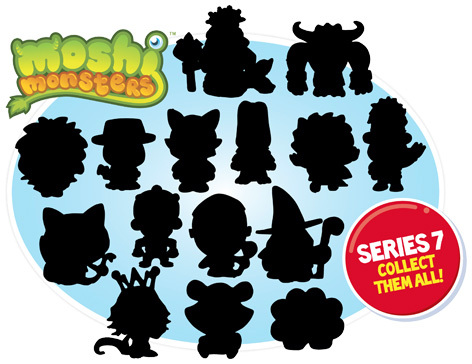 Series 7 of the Moshi Monsters Collectable Figures sees the introduction of 16 new and exciting characters to collect. Each foil bag contains two Moshi Monsters Collectable Figures (RRP £1.99), but you won’t know who you’ve got until you open it up and reveal the monsters inside! Fans can also build up their Moshi collections faster with the Collector Pack (RRP £4.99) which features five Moshi Monsters Collectable Figures, one of which is hidden. Will you get a special Golden one? Or maybe an Ultra Rare one…?! All packs come with a secret code for free, in-game Rox. Don’t forget to swap extra figures with your friends and trade for characters you haven’t already got! Please tell us what you think of the Series 7 Moshi Monsters Collectable Figures by Vivid.